“…” Mei’s nose sniffed, staring at Hua Yue with a sad look. “No, no! You have eaten too much! It’s not a thing that a lady should do, Mei.” Hua Yue looked at Mei’s ingratiating eyes, feeling both funny and annoyed. It’s not like a date at all, but like walking with a gluttonous puppy. Just now, she had bought over 30 kinds of snacks for Mei. Croquette, a string of candied haws, stone sugar, cream puff, roast chicken wings, beef skewer… as the most prosperous sword tip area in the White Lotus Sword Domain, which was connected with the outside worlds directly through the star bridge, people could find all kinds of foods from different god’s domains. Among all lower-level sword domains, only the White Lotus Sword Domain had this advantage, which should give the credit to the Sky Tower. Although it was just a projection of the real Sky Tower, however, even many middle-level sword domains didn’t have one, which made a lot of sword domains feel jealous. The reason why the White Lotus Sword Domain had this privilege was because of Yun Hai, the Sky Sword came from this sword domain. “…” Mei (Star Fire) still said nothing. She just moved closer to Hua Yue and held her arms. Hua Yue surrendered! Just like what had happened 30 times before, once Mei used this trump card, Hua Yue would immediately concede. “Well… it’s really the last time! If you eat more, you will become fat!” Hua Yue paid for a bag of cotton candy and persuaded Mei. “…” Mei (Star Fire) cocked her head. Her body was growing up! Isn’t it natural to eat more now? “Oh!” Looking at Mei’s innocent eyes, Hua Yue sighed. Only the temperature that was still remaining on her arms could comfort her heart. Mei was a bit strange today. She was gluttonous, and kept silent because of the “Closed Mouth Zen”. However, Mei is still very cute today! Isn’t she? Now, Hua Yue understood that why some people would feed their pets too many foods until their pets became as round as a ball. Because it was too difficult to refuse that pair of eyes! Pets didn’t know when was the time to refuse, just like Mei at this moment. When Mei looked at Hua Yue with the eye contact of “I want this, this, and this!”, Hua Yue would forget all the words to refuse her. Maybe she could describe it as “Mei poisoning”. The entire Starwing Knights was in this state of being, poisoned by Mei. As the leader of the Starwing Knights, she had the sickness beyond cure. Mei (Star Fire) ate the snow white cotton candy happily. Because she ate so fast, there was a lot of white flour still left on her mouth. “Don’t rush, I can buy more for you… well, it’s better to stop. 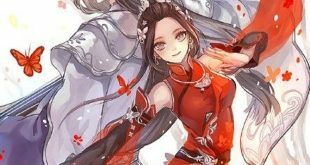 You should know when to stop.” Hua Yue stretched out her fingers and wiped off the white cotton candy on the corners of Mei’s lips, then looked at the white flour on her fingertips in a daze. Mei mischievously stretched out her hand, then put a piece of cotton candy and her fingers into Hua Yue’s mouth. This was Star Fire, she wouldn’t hesitate to do anything that came to her mind. “Awwoo!” Hua Yue was surprised. She couldn’t help but lightly bite on Mei’s finger. Compared to the cotton candy, Mei’s finger tasted more delicious. Hua Yue could barely restrain her desire of licking Mei’s finger. It makes it all worth it! First time cutting class, first skin to skin with someone, first date, as an aristocratic miss of the Hua family, she never made so many mistakes at the same time. The Bloodline of the White Golden Rose was a holy bloodline of guarding order, the natural bloodline for leaders. As a leader, she shouldn’t make any mistakes and always strive to be a perfect knight. However, Hua Yue felt a strong impulse to overthrow everything in her heart. Knight was a career for protection. If it was for Mei, even if she couldn’t be a perfect knight, she didn’t mind. Because she only wanted to be Mei’s knight, she only wanted to protect Mei, one person. This kind of knight was imperfect, and must have betrayed the road of the knight in the eyes of fastidious people. Has she degenerated？Has she forgotten her dream of being a perfect knight? No, it was just a choice. She just went and followed a different road. No one should be forced to be perfect. People should choose their own roads, they should choose their own futures. It was a right that no one could be deprived of. According to the plan of her family, after she obtained the blessing of the White Lotus Secret Treasure, she should leave the Starwing Knights and return to the Western God’s Domain, inheriting the Knights of her family. This was her inescapable duty as the successor of the White Golden Rose Bloodline. She could only be the leader of the Starwing Knights before she graduated. In the eyes of the elders of her family, the Starwing Knights was just a game that some little girls played. They were just playing the game of “Play House”. Even if they didn’t want to leave, after most girls of the Starwing Knights got married, how could the Starwing Knights still exist? They gave their support to the Starwing Knights, because they thought that it was a good warm-up exercise before Hua Yue inherited the Shinra Knights. Hua Yue’s future wasn’t in the White Lotus Sword Domain, not even in the Sky Sword God’s Domains, but in the far distant Western God’s Domains. “Mei…” Hua Yue gently held Mei’s hand and kissed on it. Mei looked at Hua Yue with curiosity. She thought for a while, then gave her half the cotton candy that had already been eaten by herself. Hua Yue’s heart was captured.